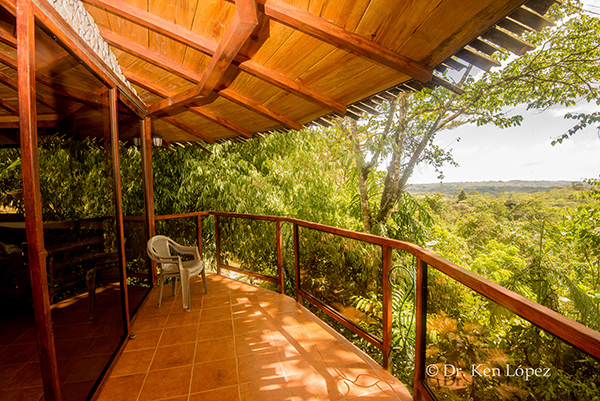 Our guest rooms consist of four private cabins perched atop the rainforest canopy. Each cabin is quiet, handicapped accessible, and offers all the amenities, including balconies with spectacular views, kitchenettes and satellite TV. While the layout of each is the same, they are uniquely decorated and designed. 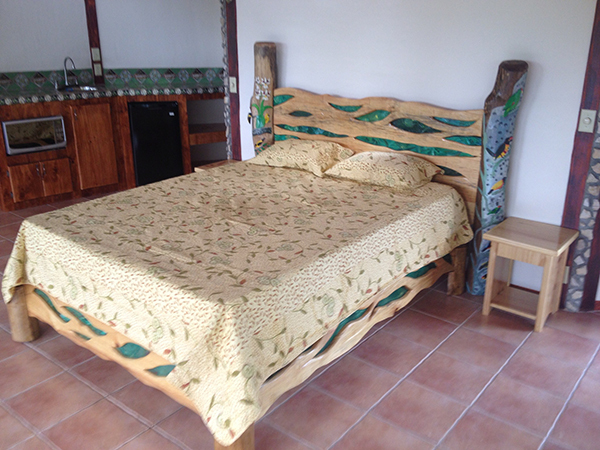 Furniture is locally made with an emphasis on local carved wood and bamboo. Bathroom/Shower is private and constructed with glass block, local rock and Spanish-style tiles from Mexico. 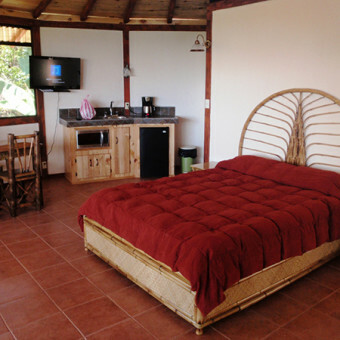 Each cabin has its own on-demand hot water heater for long luxurious showers. Water is spring-fed and safe to drink straight from the tap. Leave your water bottles at home! 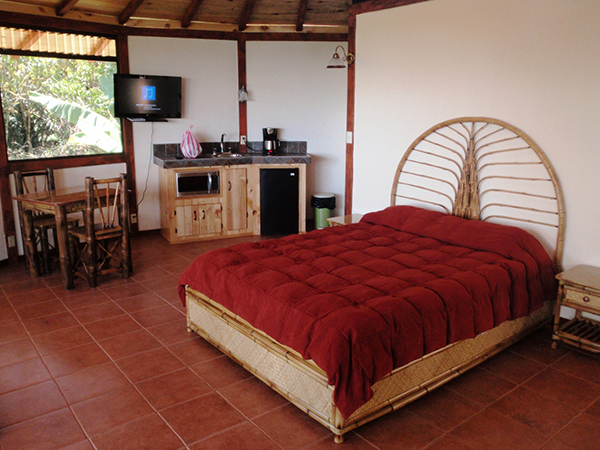 Kitchenette area is tiled and equipped with a refrigerator, microwave, coffee maker and 2 burner electric stove. Daily Maid Service is provided with extra blankets, pillows and towels always ready for you. 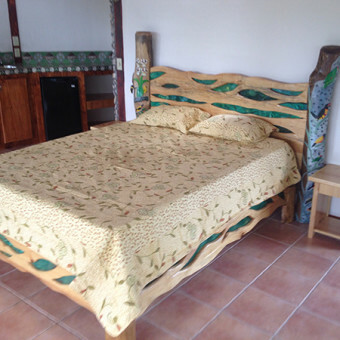 The guest rooms at Cascata Del Bosco Bed & Breakfast are $75/night for up to two people, plus $10 each additional adult. 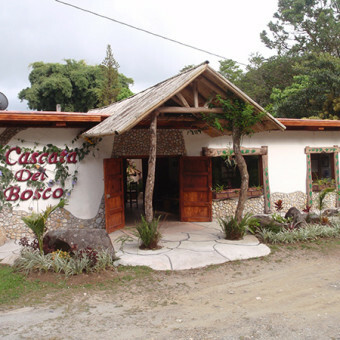 Cascata Del Bosco is situated on 37 acres of forest, neighboring the Wilson Botanical Garden, just 10 minutes from San Vito, Costa Rica. 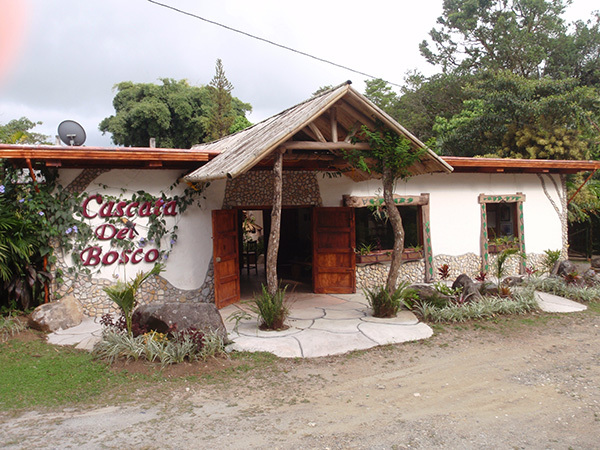 Whether you’re looking for the perfect location for your wedding, quinceañera, or corporate event, Cascata Del Bosco offers tropical ambiance, delicious cuisine, and a huge covered garden patio (in case of rains), where you and your guests are sure to have the time of your lives. 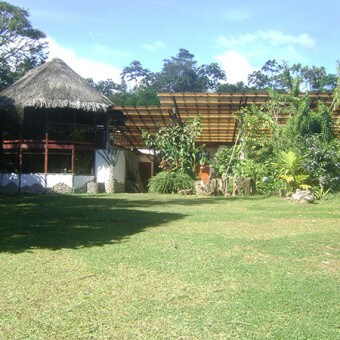 The property features large open areas to enjoy and trails throughout. 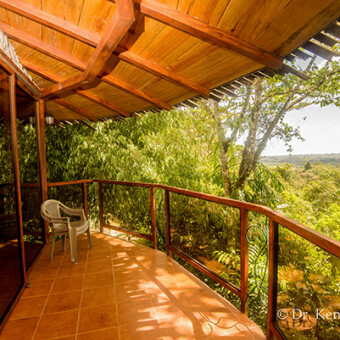 The majority of the property is jungle, rich with the native wildlife that many tourists come to Southern Costa Rica to glimpse. 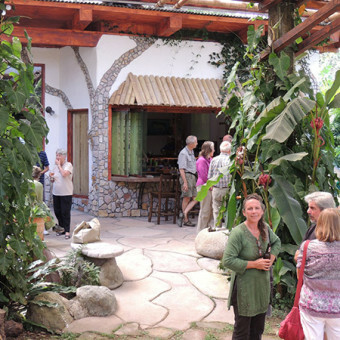 A keen naturalist might also spot some introduced exotic plant and tree species, thanks to Robert Wilson, founder of Wilson Botanical Gardens. Indigenous pottery shards are frequently found while exploring the grounds. The massive bamboo stand lives and breathes between two of the cabins and a passage way into the center is too enticing to pass up. The Bar and Restaurant area is perfect for your gatherings, meetings, or just relaxing, listening to music and talking about the day’s adventures. 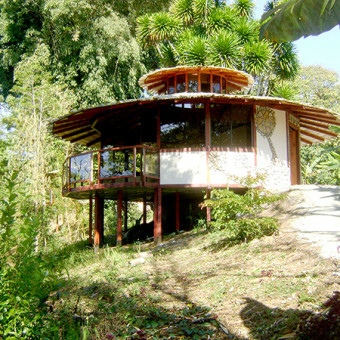 The Rancho – Up the stairs is a large private octagonal area of 500 square feet covered by a thatched roof overlooking the open areas of the property. 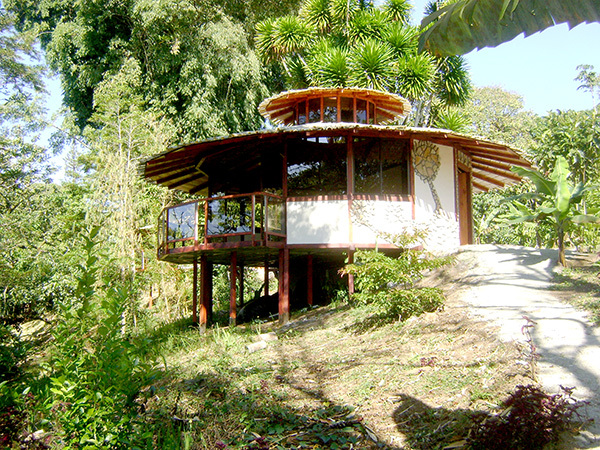 It can seat 20 people or is an awesome private place for yoga or meditation for up to 15 people. The Covered Gardens – Outside and connected to the restaurant/bar area is a large, fully covered area 50 feet by 50 feet, (2500 square feet) called The Garden Patio. Even in the strongest rains, you can enjoy the outdoor area in comfort. 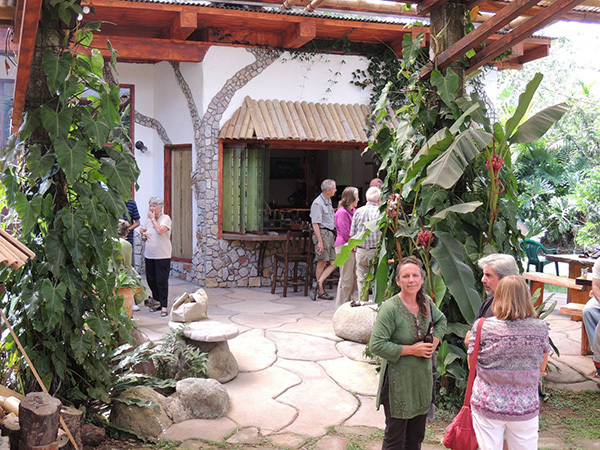 You can easily host groups large or small and be completely free from the elements. It is hard to believe you are outside as the roof is high and the view unobstructed. This is where we have our soon to be famous grill and smoker. 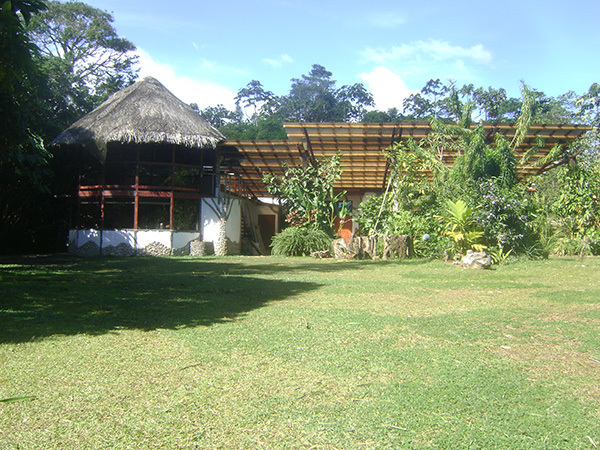 Almost all of our facilities, including two of the Cabinas, are handicap accessible.